Each quarter, we like to take a look at the most popular tools and publications that we've published so that we can get a sense of what our readers enjoy most. Check out our top 10 TOOLS of Q2 2017 to make sure you haven't missed any of our most popular content! 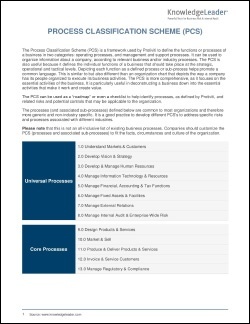 The PCS can be used as a “roadmap” or even a checklist to help identify processes, related risks and potential controls that may be applicable to an organization. This document outlines risks and controls common to the “process accounts payable” process in a risk control matrix (RCM) format. Internal audit performs this risk assessment to identify and prioritize key risks to best allocate the internal audit resources for the next year. This questionnaire can be used when analyzing an organization’s enterprise risk management strategy. This memorandum should be completed and approved as part of the initial audit planning process. This job description outlines the responsibilities, key selection criteria, and general information for the role of the director of IT project management. The director of the project management office (PMO) is responsible for the overall project management function, providing leadership, coordination and management of the PMO processes and functions. The role serves as a conduit for communication between project managers and the IT executives who make the strategic decisions for those projects. 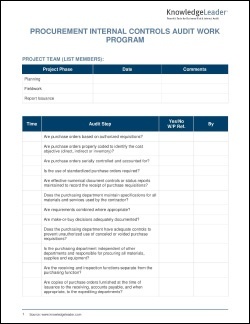 The director of PMO supervises the team that provides project management support functions and administrative support to project managers. 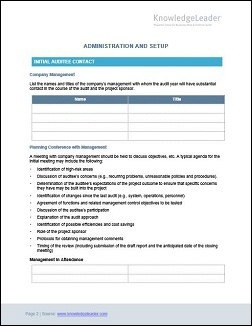 This sample audit work program reviews the internal controls in an organization’s procurement process. This executive summary provides an overview of the updated COSO Framework.